Hi there! 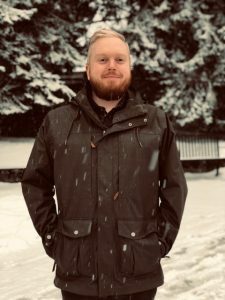 My name is Matt and I recently returned to BC after spending a few years working and studying in Ontario. I couldn’t be more excited to be your new Energy Planning Director, helping the Kootenays find a common path forwards in transitioning to 100% renewable energy. In the early 90’s, my Dad, along with the rest of the workers at the General Motors assembly plant in Ingersoll, Ontario went on strike. For a month, in the mornings before I went off to my kindergarden class, I got to sit on his shoulders on the picket line. I’ll admit that at that age, I was mostly interested in getting a Tim Hortons sprinkles donut and a hot chocolate. But as I grew up, that experience of being a small part of a community working together, with hope for a brighter future stuck with me. This social awareness stayed with me as I grew up. In my youth I didn’t consider myself much of an environmentalist. However, as I learned more about social and economic inequality in all its forms, one thing became clear to me: climate change would make all sorts of social and economic instability much worse, causing more and more droughts, famines, forest fires and floods. Like most Canadians, I’m passionate about having affordable food at the grocery store, clean air to breathe, as well as long term, stable jobs serving as the economic foundation of our communities. And this is why I’m here at the EcoSociety. Our campaign for 100% Renewable Kootenays gives me hope. If we can all come together and work towards the common goals of a better community and better climate, we can reach the goal of 100% renewable energy in the Kootenays. It will not be easy, but each one of us can make a difference. A great way that you can get involved is by joining me and asking your friends and family to sign our petition for 100% renewable energy, green jobs and healthy communities. With this simple action, you can show your leaders that the people who elected them want a brighter future, supported by 100% renewable energy.